19” racking is one of those not very glamorous but nonetheless essential products. 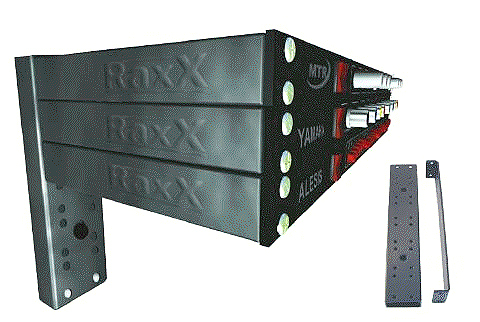 RaxX is a British-made rackmounting system with a fresh twist, using just two basic components: 6U steel uprights that screw directly onto a wall, and pairs of side arms which attach to this upright at one end, and to the front panel of the unit to be racked at the other end – an infinitely expandable concept. Designed for fixed installations, the RaxX system ‘starter kit’ consists of two 6U upright sections which are fixed to the wall using the screws and cavity fixing plugs supplied. Three pairs of 250mm 1U side arms complete the pack, and are fitted to the uprights with the supplied M6 bolts. A wall fixing guide is included to indicate the upright’s fixing hole positions. You are not bound to take the Starter Kit exactly as it is – if you need longer sidearms for example (400mm or 600mm), then fine; just order what you need. The two key advantages of this system are its cost-effectiveness and remarkable flexibility. It can be expanded vertically and indeed horizontally, since each upright has two rows of holes, able to take the right side of the first row of products and the left side of the next row along. 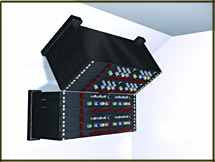 This highly versatile design makes it suitable for so many applications; installations in studios, concert venues, theatres, houses of worship, DJ booths, computer rooms, lighting systems, home and project studios, for medical equipment, custom audio/video ‘smart’ home installations, even display/demo racks in retail music shops. 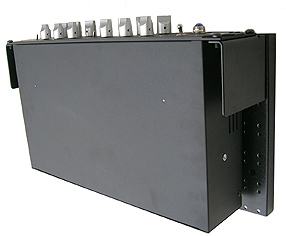 Pairs of Side Arms are available in 1U at 250mm and 400mm long, and 2U at 400 and 600mm long. Wall Uprights are 6U. Two of the 250mm side arms can be bolted together end to end to make a 500mm version for use with lighter weight items , and the uprights can be fixed one above another on the wall to make any height in multiples of 6U. Raxx System, Sound on Sound review. 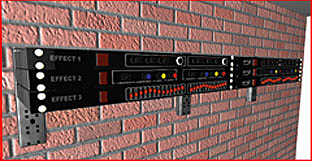 Free-standing studio racks are very useful and can hold a lot of heavy equipment, but sometimes it can be advantageous to make use of some of that spare wall space. That’s where Raxx comes in, a modular system that can be used to fix rack mounting gear to any strong wall using two sturdy metal uprights to which side arms of varying lengths can be fitted to accommodate equipment of different depths. 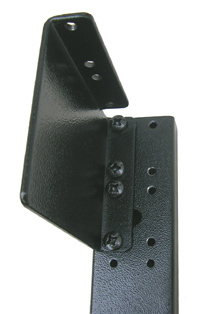 The available side arms are 1U or 2U high and have conventional rack fixing points on the front, while their rear flanges fix to the wall uprights by means of M6 cap-headed screws. The small starter kit reviewed here comprises a pair of 6U uprights and six 1U side arms, complete with fixings and M6 bolts. Additional side arms can be purchased if necessary in both 1U and 2U sizes and in lengths of 250, 400, and 600mm. 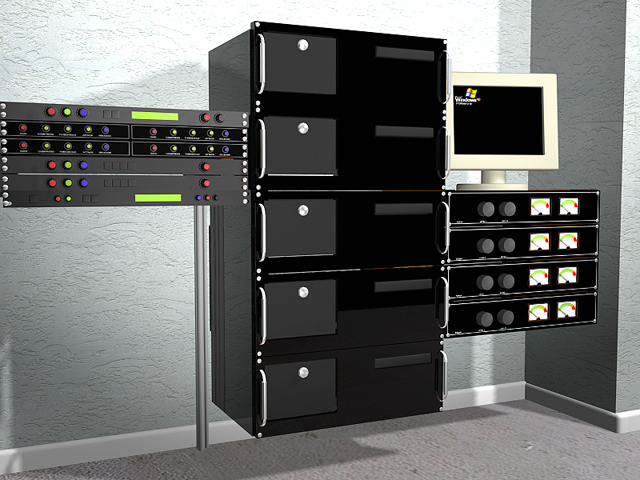 Optional components include CD racks and half rack mounting trays. When I first heard about this system, I was worried that it might struggle to hold heavier pieces of equipment, but as soon as I examined it, I realised such fears were without foundation. 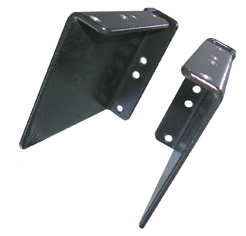 The components are manufactured from heavy-gauge steel with a durable paint coating, and all the fixing points are really solid. In fact the only limitation of the system is the purely practical one that you can’t get around the back to plug things in and out, so you need to unscrew your units from the Raxx system before you can change the wiring around. You also need to have a strong wall to fix onto, because the installed system will only ever be as strong as the wall you’re screwing into. Overall, though, this unique modular system is eminently practical. 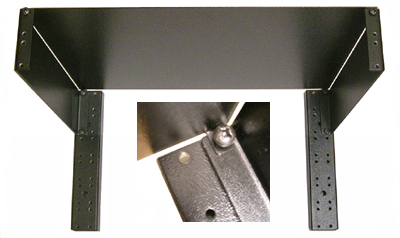 A range of RaxXcessories are available including top and bottom covers – the same cover can be used as shown below, and/or inverted and fitted to the bottom of the installation. And to keep signal and power cables tamed, we offer a 1 metre slotted cable tidy, with a snap-on cover, meeting CSA, DIN 4102/ASTM D635 specifications. If you just have one or two products to rack, a small budget to do so, and ideally you would prefer them not to stick out from the wall, here’s a clever answer. 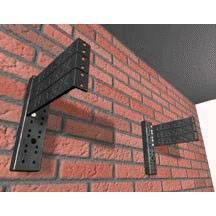 The RaxX ‘RaxXHanger’ is a pair of brackets that you attach to the wall uprights in the usual way, but allows you to ‘hang’ a 2U product (or two 1U products) vertically by the front panel, parallel to the wall and with the controls facing the ceiling. 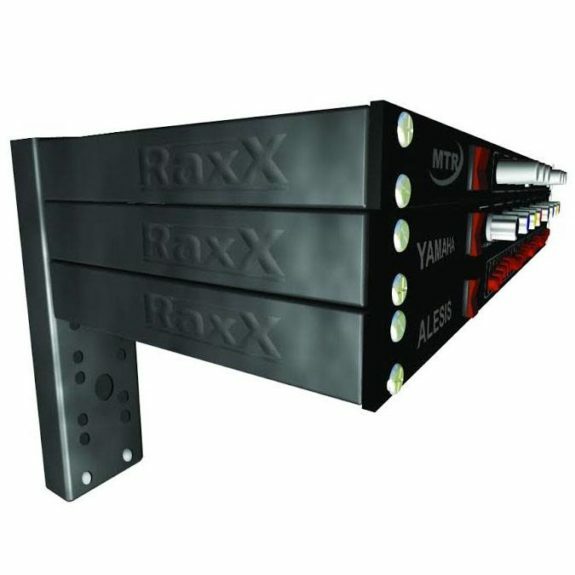 RaxX now offers a range of well designed and engineered 19″ rackmounting mains distribution units to compliment the RaxX system. Another un-glamorous product, now with extra convenience. 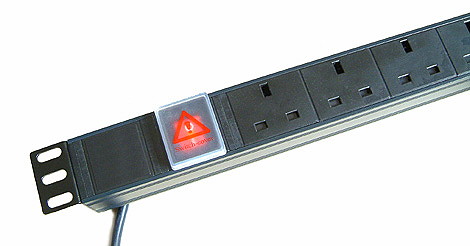 Featuring a tough aluminium body, a 3 metre attached power cord and illuminated on/off power switch with a safety cover, the polycarbonate sockets comply fully with BS1363. Horizontal models come in 4 or 6 ways. 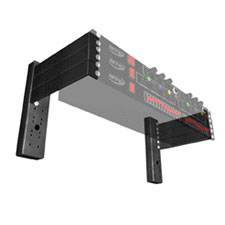 Also available are vertically mounting models with 4 or 6 ways. On these models, the mains switch is rotated through 90°.